"What I’ve realized is that even if your immediate community of faith is accepting and warm, it is impossible to escape all of the negative, hurtful rhetoric that’s out there." When Haley, this week's interviewee, said that to me, it hit deep. Like Haley, I came of age in a Christian church that rarely discussed homosexuality, and where my fellow congregants were tacitly accepting. Few things about my home church (besides its denomination's stance) would have caused me to question my ability to be both queer and spiritual. 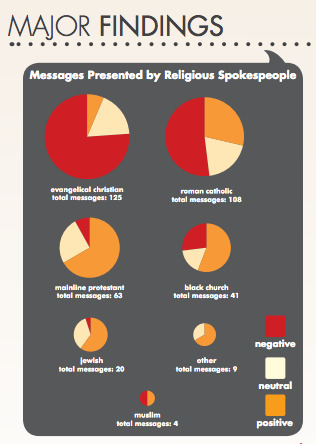 "Missing Voices" studied mainstream media's coverage of LGBT issues, focusing on religious sources. Click to read the factsheet. And yet tacit acceptance did nothing to insulate me from the dominant message that homosexuality was wrong. Instead, the messages from other Christians came through on television and newspapers, telling me that there was something psychologically wrong with me, that I was going to Hell. Haley got the same media message, and it pushed her away from her faith community -- even though they, too, were accepting. Haley and I aren't the only two who have observed that religious condemnation dominates the media coverage about LGBT issues. In fact, the 2012 "Missing Voices" study concludes that "the news media is largely omitting a pro-LGBT religious perspective and ignoring individuals who identify as both LGBT and religious." These omissions are so profound that they skew the presentation of the whole subject, reframing it into a "God vs. Gays" debate. In sharing her story, Haley took one step toward filling the void of stories from individuals who are Both. In short, she says we can move from tacit acceptance to active inclusion. We can speak a new truth, and make ourselves heard. I can't wait to see where Haley's next steps take her on this journey! P.S. If you haven't already read Haley's full story, click here to do so!